Sooner or later, someone you know may lose something in the water. It may be a mask or other piece of diving equipment. It could also be a piece of jewelry or even a boat motor. The PADI Search and Recovery Diver Specialty course will show you the equipment and techniques needed to find and recover items underwater. 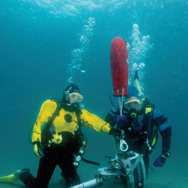 While it is important to understand that this course will not make you a Commercial Diver, it will introduce you to some of the same basic underwater recovery techniques. Prerequisite: PADI Adventures in Diving certification or qualifying cert. from another organization and be at least 12 years old. PADI Search and Recovery manual included and yours to keep. Includes: PADI Search and Recovery manual and certification processing. Scuba equipment is not included, but may be rented (advanced reservations recommended). Read the PADI Search and Recovery Diver manual and complete the knowledge reviews. You also need to complete a PADI Student Record File (which includes a Medical Statement). If you answer yes to any of the medical history questions, we must require a signed physicians approval before you participate. You can download and review the PADI Medical Statement here. Please print a copy to take to your physician for their approval and signature if required. Classes are held in Eagan, Minnesota.